Be the first to hear about their new releases and deals. Download the Booksprout app and search for Shelbi Wescott today! Shelbi Wescott is a high school Language Arts teacher, a mother of two, a television junkie, and a board game connoisseur. 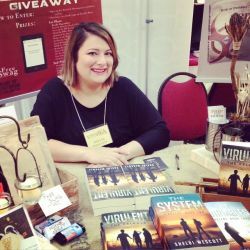 Her first book, "Virulent: The Release" was born from a challenge issued by her students to write a book that would interest them. When she isn't writing, Shelbi can be found wandering the aisles of Powell's Books, throwing really elaborate birthday parties, and officiating weddings. Shelbi lives in Portland, Oregon with her husband (a journalist), her two sons, and her hound, Darby.